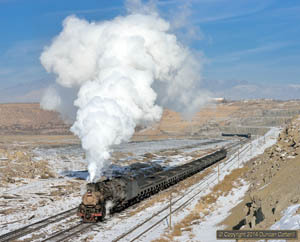 With the Rongshan NG line back in action and a new steam worked line due to open at Sandaoling, November 2014 seemed a good time to visit China again. In the event we missed out on both but still had a very rewarding trip. This report covers what we saw at Fuxin and Sandaoling, neither of which disappointed. Temporary closures of the Traunstein - Salzburg line, followed shortly afterwards by the Rosenheim - Kufstein line, led ÖBB to divert trains that normally run via the German “Korridor” from Salzburg to Wörgl for more than a week at the end of October 2014. This report covers the 3 days I spent photographing the diversions and normal services on the Wörgl to Schwarzach-St. Veit line. The München – Salzburg main line was closed east of Traunstein for five days in late October 2014 to enable bridge work. During the closure a number of services were diverted while others were bustituted or simply abandoned between München and Salzburg. A few EuroCity trains ran via Mühldorf with diesel haulage, giving me a good excuse for the 4-day visit covered by this report. 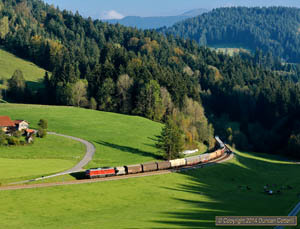 A two-week closure of the Arlbergbahn, the only rail link between the Vorarlberg region of western Austria and the rest of the country, necessitated bus substitutions for most passengers and long diversions through German territory for freight and overnight passenger trains. 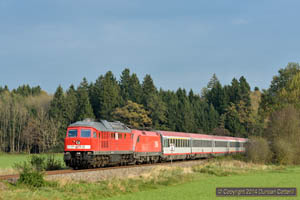 Most of the diverted trains ran via the Allgäubahn between München and Lindau, providing a rare opportunity to photograph long loco hauled trains on one of Germany's most scenic diesel worked routes. Two new photo galleries added covering the Hamburg - Westerland (Marschbahn) and the Niebüll - Tønder lines in the far north of Germany. 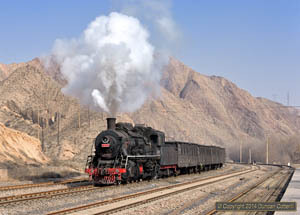 The Marschbahn is a stonghold of diesel haulage under normal circumstances with semaphore signals and some notable civil engineering. The Niebüll - Tønder line is normally a bit of a backwater linking the extremities of the German and Danish systems and operated by DMUs. 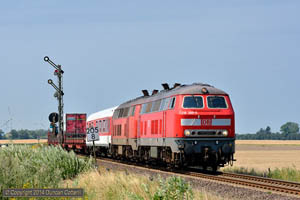 For three weeks in July and August 2014 both lines hosted diverted diesel hauled international freights as well. Two new photo galleries added covering the Fredericia - Esbjerg and Bramming - Tønder lines in southern Jutland. All the pictures were taken during the freight diversions in July 2014 and are not typical of what can normally be seen on these lines. 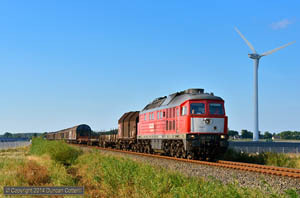 The Marschbahn from Hamburg to Westerland is one of the last strongholds of diesel operation in Germany and became even better for three weeks in July and August 2014 when a dozen diverted diesel-hauled freights a day were added to the regular loco-hauled passengers and car-shuttles. The freights continued with diesel haulage over the border to Esbjerg in Denmark and, after a change of loco from 232 to MZ, on to Fredericia. This report covers a ten day trip to the lines on both sides of the border. More German photo updates with several new pictures added to the Linke Rheinstrecke (Koblenz - Mainz) gallery and many more to the Gäubahn (Stuttgart - Singen) gallery. 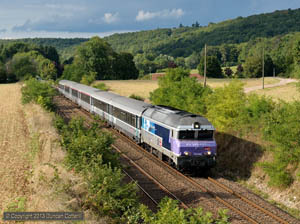 A new photo gallery with half a dozen pictures taken on the Paris - Belfort line in September 2013 has been added. This is one of the last places in Europe where big diesels can be photographed working fast passenger trains but you have to be patient as there are long gaps between trains. A handful of new pictures have also been added to the Strasbourg - Sarrebourg gallery. 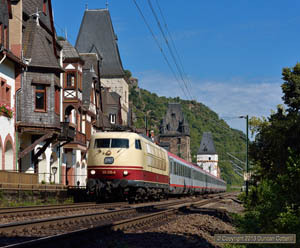 Added a new photo gallery covering the Koblenz - Mainz main line along the left/west bank of the Rhein. This was traditionally one of Germany's main north-south passenger routes, linking the Ruhrgebiet with Frankfurt and the Rhein/Main conurbation. 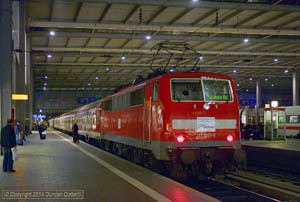 It lost most of its InterCity traffic when the Köln - Frankfurt NBS opened but there are still hourly InterCity trains, loco hauled RE services and more freights than in the past. The iconic class 103 even made a re-appearance in 2013 after an absence of over ten years. Add some superb scenery and a few mediaeval towns and the photographic potential becomes obvious. Added a new photo gallery with 10 pictures of the Simmentalbahn taken in 2013, the last year that BLS Re4/4 "Brownies" hauled passengers on the line. 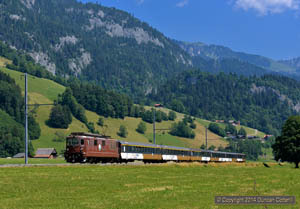 The Spiez - Interlaken gallery has been updated with 6 new pictures and 1 new shot has been added to the Lötschberg gallery. A week long photographic trip to the Rosenheim area of south-eastern Bayern, primarily to try to record the last few workings still entrusted to class 111 electrics. Although not part of the original plan, my visit just happened to coincide with a closure of the line through Passau and the diversion of numerous freights via Rosenheim instead. New photo galleries have been added covering the electrified main line west of Hannover and the steam worked metre gauge Harzer Schmalspurbahn. The Rechte Rheinstrecke gallery, covering the busy main line down the east bank of the Rhein has also been updated with many new pictures. Better late than never! Pictures from Mallorca's two very different railways, taken in March 2013, have been added to the Spain Photo Galleries. 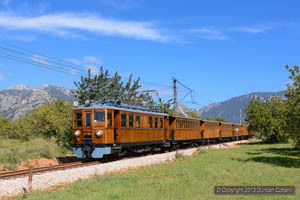 The electric line to Sóller is a gem, still using 1920's built wooden bodied motor coaches, while the SFM is all modern with grubby plastic DMUs and EMUs. 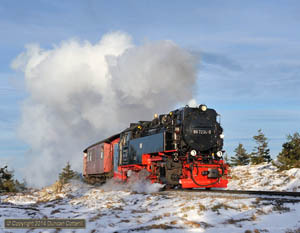 This report covers an 8 day visit to the Harzer Schmalspurbahnen in late January and early February 2014. 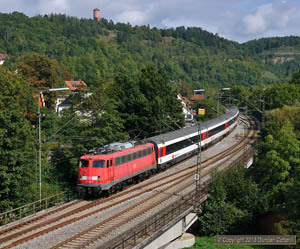 The HSB operates a 140km network of metre gauge railways in the Harz Mountains in northern Germany. 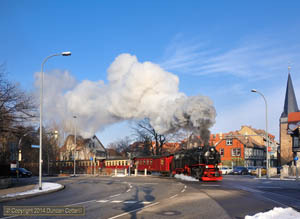 Once part of the Deutsche Reichsbahn, the system became a tourist railway following the collapse of the Iron Curtain in 1989 but has retained a lot of its original character and still operates many services with steam locomotives. The report also includes a brief look at the current scene in the Hannover area with the emphasis on freight.